From the beginning, it is worth noting that nothing is mentioned about the coins struck at Isaccea in the books dedicated to the coinage of the Golden Horde (, , , but also in four or five others that could be consulted, written by Russian or Soviet writers). However, such coins are present on the Internet , . Isaccea is placed on the right bank of the Danube, in Tulcea County. Nowadays Isaccea is a small town, having about 5000 inhabitants. Coins of Isaccea were struck in silver or bronze. 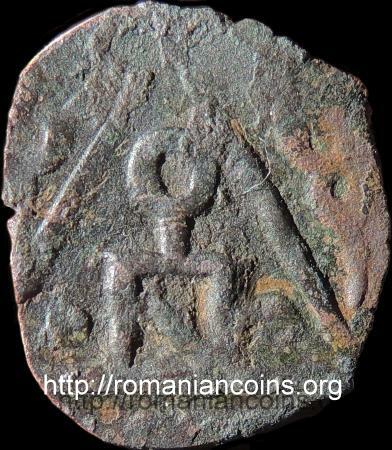 A few such coins were lately published in scientific papers , ,  or on the internet , . Most of them were found in Dobrogea, but in the Republic of Moldavia as well, for instance at Costeşti. 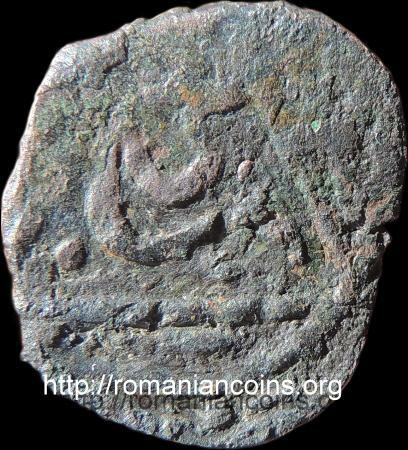 The tamgha on the coin appears also on the coins issued by Mengu-Timur (or Möngke Temür, 1267-1280) and Tokhta (or Toqta, Tokhtai, Tokhtogha, 1290-1312, son of the former) . Inasmuch as, according to , the mint at Isaccea started to strike silver dirhams and bronze puls in 1286, it is very likely that the triangle item was struck during the reign of Tokhta. The tamgha is an emblem used by the Altaic tribes (Huns, Mongols, Turkic peoples etc.). Various tamghas appear on the Tatar coins of Isaccea, corresponding to various issuers. According to , inside the triangle would lie inscription - stylized - Sāqči - ﺳﺎﻗﭽﻰ. Unfortunately, it was not possible to read and confirm this inscription on any of the available images (most of them found on the Internet). In which the possible inscriptions outside the triangle are concerned (if they are indeed inscriptions and not just adornments), it seems that no one has attempted a reading. The literature knows similarly looking coins in silver, with tamgha inside a triangle . On these formerly mentioned coins, outside the triangle, the name of the mint is written (Krym, meaning Crimea), and an adornment is placed at the base of the triangle. It is to hope that at least one coin will be found, in a good enough conservation state as to allow a straight reading of the inscriptions. The bronze coins struck at Isaccea are shrouded in mistery, sufficiently rare and only little (and very incompletely) known. 1. Crivenco A.V., Kazarov A.A., Djucidskie monetî Sakcii iz nahodok na gorodişte Costeşti v Moldove. Stratum plus, nr. 6, Chişinău, 2010, p. 201...209. 2. Fedorov-Davîdov G., The Monetary System of The Golden Horde. http://www.paleog.com/im/fd/summary.pdf, februarie 2012. 3. Nicolae E., Costin B., Monede din secolele XIII-XIV descoperite în Dobrogea. Buletinul Societăţii Numismatice Române (BSNR), XCII-XCVII, 1998-2003, p. 175-187. 4. Nyamaa B., MongolianCoins.com. A Thousand Year Legacy. Site web, februarie 2014. 5. Nyamaa B., The Coins of the Mongol Empire and Clan Tamgha of Khans (XIII-XIV). Ulanbaatar, 2005. 6. Oberländer-Târnoveanu E., Un atelier monétaire inconnu de la Horde d'or sur le Danube: Sāqči-Isaccea (XIII-XIVe siecles), Proceedings of the XIth International Numismatic Congress, Bruxelles, 1991, vol. III, Louvain-la-Neuve, 1993, p. 291...304. 7. Sagdeeva R.Z., Serebreanîe monetî hanov Zolotoi Ordî. Izd. Goreaceaia liniia - Telekom, Moskva, 2005, p. 68. 8. ***, ZENO.RU - Oriental Coins Database. ISLAMIC WORLD » Juchid, ca. 650-886 » Black Sea region » Saqche » Copper » Mangu Timur tamgha, site web, februarie 2015. 9. ***, The Successors of Chingiz Khan and Their Coins. Saqchi mint, AR dirkhams with name Nogay, site web, februarie 2015.